Now you can have it both ways. 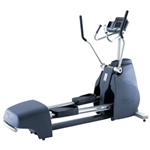 The Star Trac E-TBT Total Body Trainer is the first machine to integrate strength training into a cardio workout. The product of Star Trac's partnership with BMW Group DesignworksUSA, the E-TBT Total Body Trainer features our SelectFit technology. At the push of a button the user can choose from a pushing or pulling upper body motion, working two distinctly different muscle groups. The upper body motion can even be disengaged for a focused lower body workout. Talk about pulling double duty. Pre wired for the Star Trac E Series entertainment solution, including a 15" personal viewing screen and integrated entertainment controls, the E-TBT keeps the pace with your members' ever-changing technology needs.